Long time no blog! The interview process, on top of my regular commute and work schedule, has been exhausting. I think it's starting to wind down at last (I'm leaning strongly towards my old firm), so I'll hopefully have more energy to write again in the near future. This month involves a bit of a first for me. Throughout the two years-plus of monthly budget posts, I don't think I've ever gone dramatically over budget without having "banked" enough to cover it from previous under-budget months that year. Until now. A few months ago, I mentioned an interest in a new colorful wool-blend coat, though the desire made me feel sheepish (I didn't need-need one) and it didn't pan out. What I hadn't mentioned was that I'd, somewhat relatedly, developed an interest in the Ted Baker wrap coat after seeing it on a few other stylish women in the city. The big sticking point was price. I wasn't seeing any sales on it before most sizes sold out and the sticker price was above the general range of what I'd feel comfortable spending. Then I saw the Ted Baker coat on sale ($384 before tax). Only the oxblood color was available, but they had my likely size. Past experiences with oxblood colored clothing suggested it wouldn't work for me, but nevertheless, I ordered it. I could always take it back to the store. As for the two pairs of drapey black pants, there was a fleeting turn towards Spring weather here earlier this month that ended up being extremely deceptive. I expect to get a lot of wear from these once the weather warms up, even if they really may push the NYC attorney's business-casual envelope a bit. I'll write more about what motivated those purchases later, but it came out of a desire for more comfortable work clothing. Ted Baker Long Wrap Coat - $418.08* - I was so sure I would be sending this back, but it was just too pretty, and I was fairly confident that this was the best sale price I would get without looking to the secondhand market. The oxblood shade is more purple and less red than other oxblood-colored clothing I've tried, and somehow it works (similar shades have previously just looked wrong on me). Size 3 (the equivalent of an US 8) was the right one to accommodate my chest. The neckline is a bit finicky though, as Julycheee had mentioned about the short version of the coat. Uniqlo Women Drape Jogger - $29.90 - Because winter returned with a vengeance and remained for most of March, I haven't worn this out of the house yet. On my short for my 5'3'' height legs, these pants are the exact right length, no hemming needed, though they may show a bit less ankle than on the model. Silk Ankle Pants - As with the Uniqlo drape jogger, March weather has not allowed me to wear these out yet. I bought the short length, which are exactly right as ankle pants on me. Women's Oxford Boyfriend Shirt - This was an impulse buy, one I decided on before the Ted Baker coat ate up my budget for the next several months. 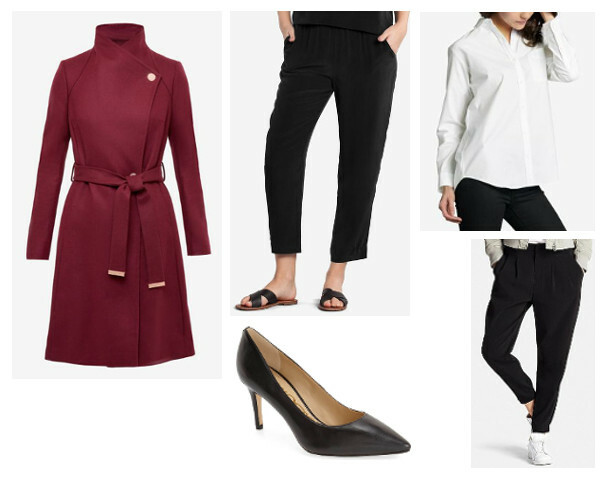 I've never had a relaxed-fit white button-down that I could see myself wearing with casual outfits (I wre the J.Crew Stretch Perfect Shirt with my suit for interviews when I was in college, but that's a very fitted look and wasn't what I wanted for casual wear). Because I trusted Grana's size measurements and general quality, I thought this was one to try. This kind of shirt for casual wear is a little out of my comfort zone, so we'll see how it works out for me once the weather warms up. **After $20 referral credit, thank you to readers who signed up through my link. If you are a new customer and sign up through my link, you will get 10% off your first order, and I will get $20 Grana store credit for the referral after you purchase. Thank you for your support! Sam Edelman Tristan pumps - I finally put in an order for the ultraconservative interview shoes I needed. These were the first pair I ordered, and they were comfortable immediately (for the duration of a three hour job interview with walks around the office building halls a few times, which is not always a given) and seem to require no breaking in. At a 3'' heel, they're a bit taller than my previous tallest pair of pumps, so I'm still getting a little used to the height. I my experience, Sam Edelman shoes have a better track record for comfort than Cole Haan ones (the alternatives I would have considered next) so I was fairly confident about keeping these instead of trying others. They're slightly discounted at Zappos, by the way! For 2017 so far, I am now $354.98 over budget (($150 x 3) - $555.98 - $154.21 - $94.79 = -$354.98), or over budget by about 2.4 months. This doesn't mean I absolutely cannot shop again until June, as my budget is flexible month-to-month. (I commit to staying under budget for the year, this year at $150 x 12 = $1800, but otherwise I don't sweat it.) This is the most off track I've ever been since I first started doing these posts way back in 2015, though, so I have to be significantly more careful for the rest of the year, at least until my budget starts looking more on track. Linking up to Franish and the Budgeting Bloggers, as usual, this month. Be sure to go check out what everyone else bought!